I recently ran into an issue while working on an iOS app using Windows Azure Mobile Services. The problem was that I wanted multiple users to be able to log into the same app on the same device, one after another. Now, if you don’t tell the provider your logging into to Remember You, this isn’t as much of an issue. If you restart the app or call login again, you’ll be prompted for the user’s credentials. However, if the first user to login does select the Remember Me checkbox, then when you start the app again or call login again, the app will open the authentication web view and see that the user has already authenticated. Today I’m going to walk you through adding Twitter authentication to an app and then explain how to properly log a user out. After that, click the checkmark and your mobile service will start getting set up. Less than a minute later, your mobile service should switch from Creating to Ready and you can click on it in the list of your mobile services. The first page you’ll see is the Getting Started section which enables you to download quickstart applications in the available platforms as well as to get instruction on connecting an existing app to mobile services. We’re going to bypass this for now and set up authentication first. After that, hit the save button at the bottom and confirm saving your changes. Now you can test that authenticating with Twitter will work by going to https://yourmobileservice.azure-mobile.net/login/twitter (after you’ve changed it to use your service’s URL). You should see a Twitter authentication page appear. Expand the Create a new iOS app section and click the Create TodoItem Table button. This will take a few seconds to run and will then say the table has been created. Next click the Download button and download the zip that comes up. Extract that and open the QuickStart.xcodeproj that is inside of it. You can run the app now and see that it’s a simple todo list application that allows you to add items and mark them complete (by swiping on the item as though you were going to delete it). 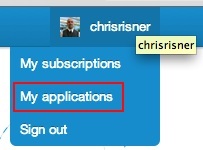 Enter the credentials from your twitter account and DON’T hit the Remember me checkbox before signing in. Provided you entered your credentials correctly, you should see the todo list show up again and pull down the items. Now return to Xcode and rerun your application. You should see the Twitter login pop up again. This is fine because the user didn’t ask to be remembered and we reinstalled the app from Xcode. Login again and this time hit Remember me. Now, if you return to the home screen and kill the app (double tap the home button after you’ve returned to the home screen. Tap and hold down on the Quickstart app. Finally tap the red minus above the QUickstart icon and hit home again), and then run the app again, you’ll see that it has remembered your user. However, let’s say you want to handle logging out. Now when we run our app and tap Logout and then run the app again, we should get prompted for our credentials. In reality, we’d probably want to also clear the items on the screen and give the user an option to login (perhaps by changing the Logout button to Login and then handling it there) but for clarity’s sake, I’ve skipped that in this walkthrough. Frequently users will never make use of logout functionality (how often do you logout of the Facebook or Twitter app on your phone?). However, it’s important to provide it in the situations they can (such as wanting multiple people to be able to login after each other). In the future, we may look at adding this ability into the SDK itself so that when you call logout on your MSClient, it removes the cookies for you. However, the danger here is that the provider can change their cookies and mess with how this logging out works. This is also a consideration you should have if you decide to try to only delete the provider specific cookies in your app. You can view the full app sample code for the application here. You will have to edit the TodoService.m file and enter your mobile service URL and application key before the application will run correctly (as well as set up the Twitter authentication as described above). If you need a Windows Azure account, you can sign up for a free trial here. What would the android cookie clearing code look like? Where mContext is the app or activity context.